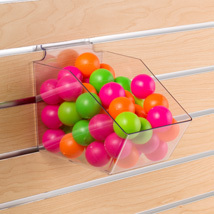 The Plastic Bins are ideal for impulse items throughout your store. Angled opening for easy access to product. Maximize space; bins stack tightly on slatwall. Can hold up to 5 lbs. of product.